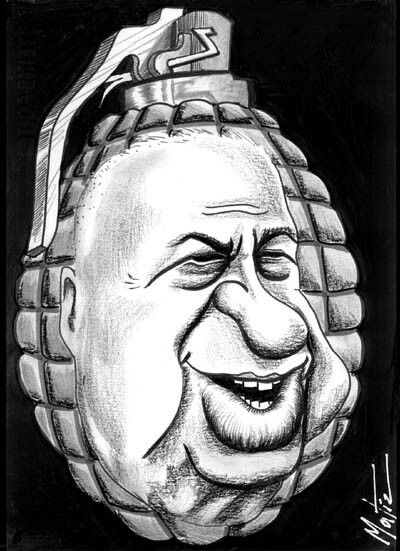 At this writing Israeli Prime Minister Ariel Sharon lies on the cusp of life and death, both literally as well as politically. Frankly, as someone who lost a father to a brain aneurysm, I know how this can impact the power, personality and abilities of a person. For the leader of a country, it’s safe to say that this is the end of Sharon the head of state. The bomb in his head has exploded, and every person in the Middle East has a headache, whether they know it or not. Sharon, like Arafat, has created his own orphan dynasty. Kadima is a party without history, composed of factions thrown together by the scent of money, with a goal that seems to be monomaniacally focused on disengagement and detachment while looting money for personal or private political or religious ends. The second ticking bomb is literally the continuation of the State of Israel. Not from enemies from without: the IDF can hold its own. It’s how our undefended: the schools, the hospitals, the poor, the hungry, the disaffected can protect themselves from what surely will be a free-for-all to create a new political order in Israel. This danger point is an opportunity for Israelis to take stock in where they are. Which parties, not people, have the good of the people in mind. This might be a time for Labor and the Likud to come together and run the government in association with whatever is left of Kadima, after it suffers its inevitable defections back to more suddenly-enticing parties. Or Israel can continue to stumble down the path to internal social destruction in the name of national security, unity and religious oppression. Refu’ah Shlemah to the Prime Minister.